Wedding is one of the most special occasions in anyone’s life. Everyone wants to make it special and look special on that day. It is one day that you will cherish through your whole life. And the joy you get when you look back at that special day after many years cannot be matched with any other day in your life. 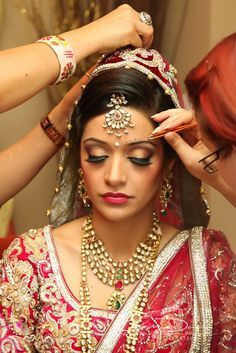 Everyone wants to look stunning on their wedding day. And other than your eyes, what else can add more to your stunning look? Your eyes reflect all your emotions. And these emotions will reflect in every picture that you cherish for the future. So it’s necessary to make sure they look best. Wedding is not the best type to experiment with the shape of your eyebrows. So better avoid your idea of shaping your eyebrow like your favourite celebrities at this important time. Before deciding on shaping your eyebrows, keep the shape of your face in consideration. Get your eyebrows shaped accordingly rather than blindly copying some celebrity styles. Thinning your eyebrows is old style now. Thinning the eyebrows might take away the overall look of your face. So it is better to avoid that before your special day. Right now, thick eyebrows are the new rage. Keep your eyebrows thick and well groomed. Make sure your makeup artist has what is needed to give you the look that you will love for the rest of your life. So make sure the makeup person you are visiting is good enough, at least from a few weeks before the wedding date. If you are new to using eyelashes, start to practice using them from a few weeks before wedding. This will avoid any uncomfortable feeling that you will be having. Practice using eyelashes with glue. To fit your eye size and the eyelash length, you might have to crop the lashes using fine scissors. It is important to choose the right colour eye shadow for getting your perfect look. The colour of eye shadow should match with the colour of your wedding dress, and more importantly should match with your skin tone. Red is the most common colour that is used by brides, but there are many other new colours that are in fashion right now. Colours like bronze or gold always work well for an Indian skin tone. These colours help to create a smokey look for your eyes. These colours also go well with the common Indian wedding dresses such as lehangas or sari. For your Indian skin tone, there are other good options too. Go for the dark peachy shades. They also look good on Indian skin. For those angels who plan to wear those white wedding gowns, you can better choose between pinkish and orangish shades. They do go well with the white gowns. Give your eye a dramatic look by giving the eye shadow makeup an extension at the edge. Eyeshadows can really add a lot of drama to your face. Before doing eyelining, it is important to keep in mind the shape of your eye and do it in a way thaat suits the shape. If you have small eyes, go for a thin lining. You can also go for a thin lining at the bottom. This will help your eyes appear big. If you have big eyes, go for thicker lining. Do a thick lining on the top. Do a dark bottom lining also. This will minimise the wider appearance of your eyes. There are some common things to be taken care before choosing products for your eye as well as skin care. All the products that you choose for your eye and skin care have to be irritation free. It would be good if you buy the eye and skin care products well in advance of your wedding day. Also make sure that you try it at least once before your D day. This will help you in avoiding any kind of wedding day disasters. Brand names won’t help you out on your wedding day. Sometimes the best brands may not work out for your skin tone. So do all the experiments well in advance of your wedding day and choose the one that suits you well. Make sure you try and fix your wedding day make up well in advance. If you have plans to use coloured lenses for your special day, buy them at least on month in advance of your wedding day and start using them often. This will help you understand how comfortable you are with them and avoid any kind of uneasiness with them on your wedding day. Make sure you try out these tips well in advance of your special day, and be ready to look best on your special day. Have a picture perfect look for your wedding!! Like your article on bridal makeup, am recently engaged! Wow, it’s interesting that you talked about finding someone that has what is needed to give you the look you want. My younger sister is looking to find an eyebrow care center she can change the look of her eyebrows. I think I will talk to her about finding a shop that has everything needed to fulfill her vision.